This Tourist Board three star rated Gold Award property with its high quality furnishings, pretty, village setting and handy location near to Cambridge, provides excellent value for money. The White Barn is a newly refurbished, traditional weather-boarded barn in the beautiful village of Hilton. With tasteful, comfortable furnishings and plenty of character, it provides ground floor accommodation with an ensuite bedroom and light and airy open plan sitting room where French doors open on to the private patio garden. 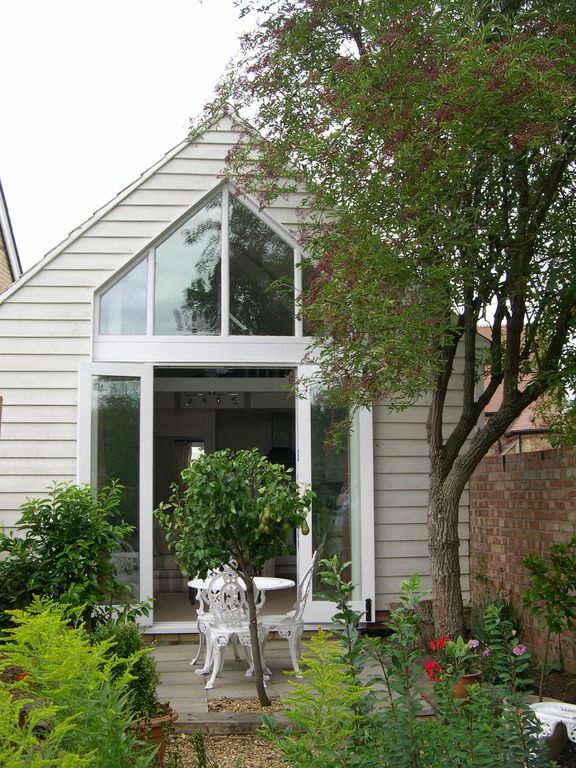 The Barn is a self contained unit adjacent to the owners' Victorian house and garden. The White Barn is privately owned and family managed. It is well situated, close to the historic market towns of St Ives, Huntingdon and Ely, and within easy access of Cambridge. It lies in the heart of beautiful Fenland scenery with its many historic and wildlife attractions. It has wi-fi internet access with super-fast fibre optic broadband. With tasteful, comfortable furnishings and plenty of character, The White Barn provides ground floor accommodation: open plan sitting/ dining/ kitchen area, bedroom with ensuite bathroom, French doors to patio garden. Newly refurbished, it is in excellent condition with new, up-to-date equipment and utensils, including dishwasher and washer dryer, smart TV and DVD player and wi-fi internet access. The bedroom has a high quality, comfortable new bed and mattress, and the ensuite bathroom is completely tiled with new modern fittings, including bath, thermostatic power shower and heated towel rail. A travel cot or ready bed can be provided for small children or babies. There is a delightful patio garden, with table and chairs, a small pear tree and plenty of flowering plants. Car parking is on the drive in front of the barn and is lit at night with security lights. There are no steps from gravel parking area to front door. Hilton village contains a small village shop and post office and a pub which serves food, as well as a children's play park, green and riding stables. I am Claire, and I run the White Barn along with my husband, Cameron. We have a thirteen year old daughter Kara and we live next door to the Barn. We're on hand to help you with anything you need, but the White Barn is entirely self contained with its own garden and separate entrance from the driveway, so you will have complete privacy. I work as a university lecturer in Cambridge and my husband works for local government while Kara attends the local secondary school. The barn was in a rather dilapidated state when we moved here, so we refurbished it to our own design in 2006 and have really enjoyed having visitors who can enjoy its special character and the charm of Hilton village. I grew up in East Anglia, and my mother still lives in Lincolnshire and my brother lives in Cambridge, so this area has been home to me all my life. It's a great region to live and work, with plenty to do. The best aspect for us as a family is that we can enjoy village life out in the countryside, yet have access to the theatres, shops and museums in Cambridge in under 20 minutes. Hilton is a beautiful village with some lovely historic houses, an extensive green and a common which is great for walks, and of course it has its famous turf maze. Hilton has a great community spirit with a Feast week in early July every year with marquee on the green and plenty of entertainments. It's great to see children of all ages running round the maze. The White Barn has great character - its best feature is the high, angled ceiling supported by beams and the large windows covering the whole of the wall to the garden. Everyone loves the amount of light that comes in, while at the same time, the Barn feels cosy and comforting. It's an old-fashioned weather-boarded barn on the outside, but has all the benefits of being a new-build on the inside. It's location also has dual benefits - you can enjoy village life, the countryside and the rich history around Hilton but also visit the vibrant and historic city of Cambridge in only a few minutes. Full bathroom. Bath with electric power shower (shower is not separate). Towels included. Toilet rolls, liquid soap and shower gel provided. Central Heating - thermostatically controlled radiators in all rooms, fired by new, efficient gas boiler. All linen for bed provided. This is an all in one washer-dryer. Clothes horse also provided. Two sets of towels are included. Comfortable for three people with sofa and arm chair. Neff electric, ceramic hob with child lock. We provide tea, instant coffee, sugar, salt and pepper, washing up liquid, hand soap and dishwasher tablets. Tea towels and washing up sponges are also provided. Plenty of dishes, cutlery, glasses, cups and mugs are provided, along with pots and pans, casserole dishes etc. This is a full kitchen with all modern appliances packed into a small space. The dining area adjoins the kitchen and living room. Books on the local area and local history, plus a few novels to chose from. We have a small collection of board games. We have a small collection of DVDs available. Small garden with patio, table and four chairs. Garden is enclosed and has small pear tree and plenty of flowering plants. Cyclists are welcome to keep bicycles here or in our own garden. A lovely little place for two. We had a fabulous time in the White Barn. It's perfect for two. It was clean and very welcoming with everything you could need. Thanks very much for a great review. We’re really glad you enjoyed your stay. We will be laying a new patio in the garden shortly, ready for the nice Spring weather. Very clean, well equipped accommodation with door to a pretty little patio. The barn bedroom window is very near the road so there is some traffic noise at the moment due to roadworks near at hand. Thanks very much for a good review. We are experiencing some extra traffic at the moment due to the work on the new A14, but, thank goodness, it's not a permanent situation! This is the second time we have stayed at The White Barn. It is very clean, nice and cosy, everything you need. We highly recommend this and hope to stay there again. Thanks very much for such a lovely review! We're really glad you enjoyed your stay and that the new mattress on the bed was so comfortable. We look forward to seeing you again in the future. Easy booking responsive owners. Comfortable interior. Thanks very much for your review. We're really glad you enjoyed your stay. We have just had our old gravel driveway replaced with a proper drive. There's no plenty of room and it's easy to manoeuvre and drive on and off. Thanks very much for your review. We're really glad you enjoyed your stay. We've just had a new driveway laid and the outside of the barn freshly painted - still white of course! Great Barn is lovely setting! We're really glad you had such a good stay. A great idea to get away between Christmas and New Year, explore Cambridge and have a cosy time tucked up in the barn. Hope you'll come again. The local area is rich in history. Close to Hilton is the picturesque market town of St Ives, home to Oliver Cromwell and nearby is the university town of Cambridge with its beautiful colleges and museums and opportunities for punting and shopping. The magnificent cathedrals of Peterborough and Ely are within easy reach, and there are numerous historic properties in the area such as Anglesey Abbey, Wimpole Hall, Houghton mill and Audley End. Visit Duxford Air museum or the peace of the American military Cemetery at Madingley. Flag Fen reveals the remarkable 3,500 year old Fen Causeway, while Bletchley Park was home to the Enigma codebreakers of World War Two. Visit the wild life sanctuaries of Welney and Paxton Pits, or the conservation zoos at Hammerton and Linton. There are plenty of activities locally to engage all ages of visitors, from walking, horse racing or riding, cycling or sailing, to boat trips around the waterways or punting from Cambridge to Rupert Brookes' Orchard Tea Rooms at Grantchester.